You may not think of your elbows very often – except when they become painful. Our Toronto physiotherapists, chiropractors, and other sports medicine specialists see many patients with a painful condition commonly called tennis elbow. Yet, many of them don’t have anything to do with tennis. Tennis elbow affects the tendons in your elbow. It is a condition caused by overuse and muscle strain, and can develop over a long period of time, or relatively quickly, depending on the nature of the root cause. A primary healthcare providers, our Toronto physiotherapy, chiropractic, and sports medicine specialists conduct a thorough assessment and evaluation of a patient’s condition and lifestyle issues that may affect treatment. The muscles of the forearm serve to flex the extensor muscle which attach at the elbow. You contract the forearm muscle to raise, straighten, and twist your hand and wrist. Microscopic tears develop in the tendons, resulting in the pain and inflammation of tennis elbow. Pain will be felt on the outside of the elbow, and may radiate down to the hand. Ordinary movements such as turning a door knob can become painful. In previous eras, lateral epicondylitis – its medical name – was also known as writer’s cramp, and washer woman’s elbow, and that points to the major causes and risk factors for the condition. Repetitive motions of the wrist and arm are the most common cause of tennis elbow. This occurs most often as the result of an activity, hobby, or occupation, such as construction work, baking and cooking, sewing and needlework, plumbing and house painting, and many more – including tennis and other sports. Tennis and racquetball players take note: repeatedly using a poor backhand technique can overextend the forearm and lead to tennis elbow. 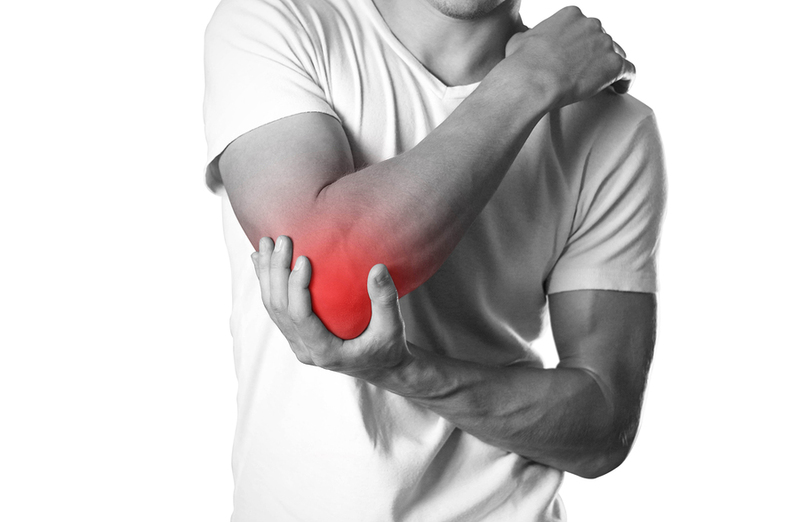 The damage leading to tennis elbow can also occur all at once, in a relatively short space of time, due to overuse. Learning a new skill such as playing guitar or piano, for example, sculpting or painting, can involve repeating specific motions many times daily or on a regular basis on an intense schedule. Age is also a risk factor. Most cases of lateral epicondylitis occur in patients between the ages of 30 and 50, and the frequency and severity of tennis elbow increases with age. The body is less able to heal itself as it ages, leading to increasing levels of damage to the soft tissues that an overwhelmed system can no longer repair. Mild to moderate cases of tennis elbow can often be treated with rest, ice packs, and over the counter pain medications such as acetaminophen. If you are experiencing pain in your elbow, or any other musculo-skeletal condition, our Toronto physiotherapy and chiropractic specialists can help with a thorough assessment and diagnosis, and customized treatment plan. Call us or come by one of our Toronto clinics today.